I've unboxed many many things in all the years I've had the great luck of doing all of this, but this item easily stands head and shoulders above anything that has ever been sent to me before. 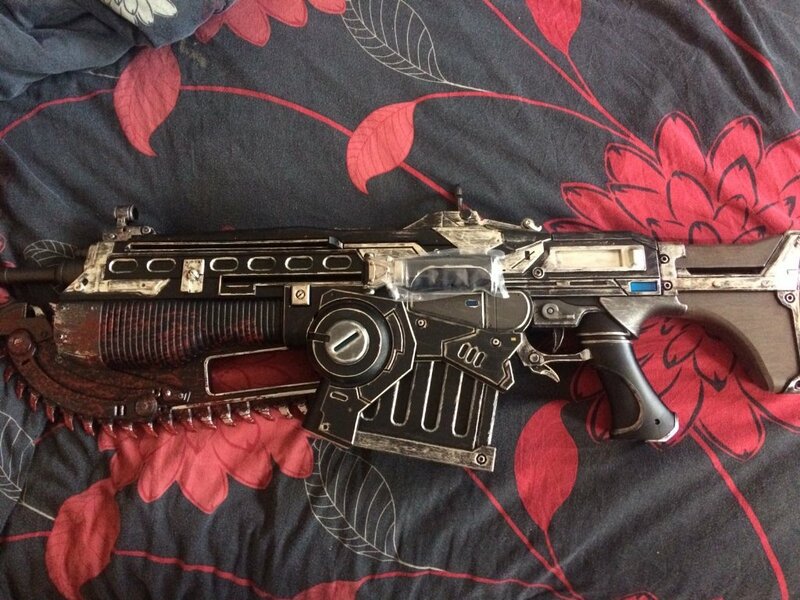 To say I love Gears of War would be a huge understatement. With me looking at the Gears series as something that has easily played a massive role in the gamer I am today. Gears 1 will always be a game that not only made the Xbox 360 the successful console that it was, but is a series that for me is the one reason I stuck with my Xbox One pre-order too, as no way was I going to miss a future Gears game just because the console never came out swinging in its early days. But this post is not about console wars, I'm here to talk about what is easily my favourite gaming item in my man corner to date. 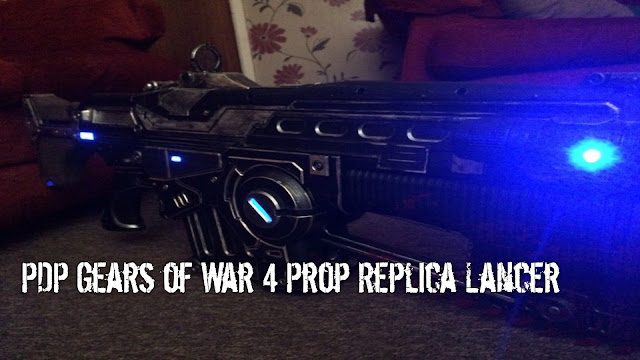 This replica Lancer is officially licenced by Microsoft, and being honest with you is super hard to find anywhere in the UK actually selling it. Getting in touch with PDP and them coming through for me I shall always be eternally grateful for, but that doesn't mean I won't be fully 100% like always in the following words I say about it after having it my hands for the last few weeks. The unboxing can be found here on YouTube, but let's find out if this is worth the $149.99 asking price that it's currently selling for on Amazon (Active UK listing is super rare to find currently but Game have it here but out of stock). Opening up what's let's be honest here is a pretty bland box on the outside, I was hopeful that the gun itself would show a lot more effort when it came to design. Unboxing the thing and getting things like batteries in was a pain. I can't lie to you. The compartment which power the main lights just being a little annoying to actually get to when you just want a few lights to work on each side of the gun. I had all the right bits to undo all the screws and what not, but with my big man hands and instructions that weren't the best, it took me a good 20 minutes or so to get it all done and ready, so I dread the day when they run out. With material like this on an expensive item I also always worry about breaking things, so the time it took was maybe just because I handled it like a newborn child. I've not asked fellow reviewers if they had the same issue, but certainly something to be wary of if you treat these items like you are holding a bomb that's about to go off. Once set up and you can stand back and take it all in. Words can't really express how nice it looks and will look in your gaming corner. Even now after having it for a bit I catch a new angle sometimes and see a new part of it that I had missed before. 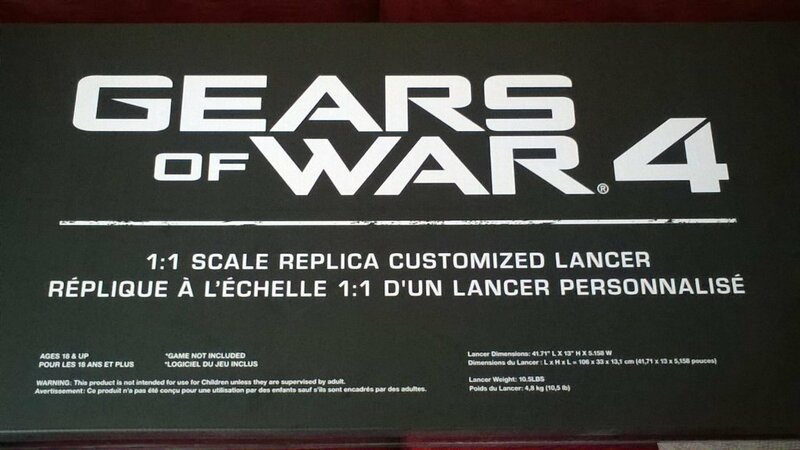 I guess the one downside to the whole Lancer is the lack of any moving bits or sound effects on it. A Gears Lancer for me needs a revving noise on it to make it just that little bit more authentic. In terms of it being great to look at I can't fault it, but for the money it costs I think a few more things are needed to really justify spending the wad of cash on it just for it to sit in the corner. Sure, as a talking piece for people who come over it will be something to stand out. Once they ask how much followed by what does it do, you don't really have much to say. 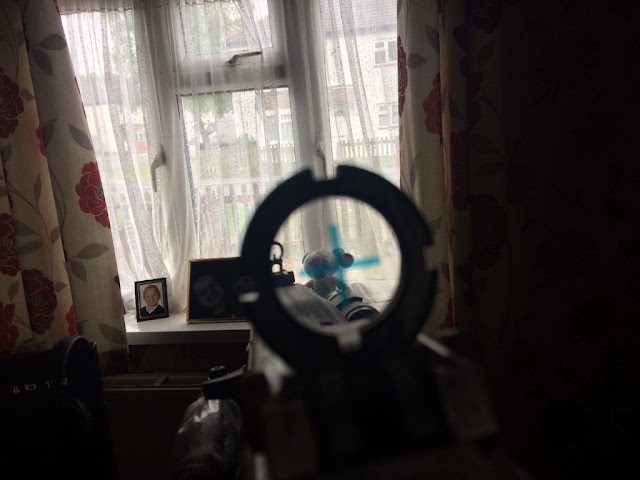 You do have things like the moveable handle on the one side, an ammo clip that can come out, triggers that feel like triggers, and a gun sight that can pop up and down. Once all those are out the way you can wow them with the shiny lights and removable spotlight on the gun, but that's it. Overall: Great collectable for any Gears fans out there. Some may find it a bit pricey for what you get in return. Looks fantastic, just not much to offer beyond that.